• New Year Period, 5000THB per person. On receiving you’re booking we will send you an email asking you to pay the pre-prepayment. You can do this using paypal or a credit card. If you do not receive this pre payment email, please contact us straight away to our email (you could find on your booking confirmation letter.) Also please have a look in your spam folder, it might automatically get sent there due to your email settings. Full Refund up to 14 days before arrival. The following group types are not accepted by this hostel: Junior / Primary School, College / University If you have misrepresented the type of group you are booking for, your booking may be cancelled by the hostel." Dancing Elephant started life 9 years ago as the island’s first backpacker hostel. In 2017, we moved to a new location on the beach in Baan Tai. We are proud to be more than just a beach hostel, as a place where hundreds of people come together to make new friends and enjoy the best Koh Phangan has to offer. Come alone, party together, and leave as lifelong friends. Soak up a bit of sun, play beach volleyball, and enjoy happy hour with a beautiful sunset. Get involved with some drinking games while getting to know the other guests. In addition to being located on the beach, we’re also in a prime spot to pregame before Half Moon Festival, Black Moon Party, and Jungle Experience. The Full Moon Party is a short taxi ride away but rest assured, we’ll still be showing you the best (not to mention safest) way to enjoy the party! We HIGHLY RECOMMEND that you arrive four nights before the Full Moon Party, as it’s a week-long festival rather than a single night of fun. Many people believe that the parties leading up to the main event are even better than the Full Moon party itself! Allow yourself to fully enjoy the full moon by NOT checking out the morning after. The party goes until after sunrise, followed by an AFTER PARTY. You aren’t staying with us to experience the Full Moon on your own. You are staying with us to make loads of amazing friends to SHARE the experience with. Come a bit earlier to enjoy some great parties (before the Full Moon), and give yourself more time to get to know the people who’ll be partying with you! It’s in our nature to bring people together so if you think you’re going to chill by your lonesome all day, just know it won’t last long! Run by party veterans from America & Thailand and the crazy owners David and Nanda from France and Burma. Fellow travelers ourselves, we’re able to provide a great contrast of experience, worldwide knowledge and of course an amazing party that you'll never forget! You’ll be hard pressed to find a team more committed to providing an amazing Full Moon experience. We provide a clean and safe hostel, with vibrant character and colorful charm like no other you will visit in Asia. Regardless of whether you’re traveling solo or in a group, you’ll be calling this home straight away. We strive to provide each and every one of our guests with five-star service along with a comfortable, friendly atmosphere that makes everyone feel at home. Each guest should expect to leave the island with newfound friends that they’ll be in touch with for a lifetime. This is a result of attracting amazing people such as yourself, and the five-night minimum which gives us plenty of time to bond! We have multiple dorms and private bungalows ranging in size with various views. Check out the photos of our newly opened 24 bed beach front dorm - it’s spectacular! You’ll never think about dorms the same way again. Everything is kept cool with 24 hour air conditioning to let you get a good night’s sleep, ready for the next day’s action. We do fill up fast so book in advance! We host warm up parties for all the major events on the island. A DJ playing live at the hostel, while you get to know the other dancing elephant party animals! We organize event tickets and cheap taxis to get you there safely and through the doors quickly. Who likes to wait?! Get out of bed, hang overs aren’t that bad!!! There are many cool things to do in the day which are a whole lot better with 50 - 100 bunk mates all sliding and flying into water, enjoying sunsets on booze cruises and much, much more. After arriving in either Haad Rin or Thongsala pier you will take a short walk to the taxis. Let the taxi drivers that you are staying at Beach Club Dancing Elephant in Baan Tai. The drivers will advise you which taxi to jump into, and you should be paying no more than 100 THB per person. - No food or drink (water is ok) allowed in the dorms. We provide towels, lockers, filtered drinking water, and free wifi. You will need to provide your own padlock for the lockers. All common areas and lockers under CCTV surveillance for the security of our guests and their belongings. On receiving your booking we will send you an email asking you to pay the pre-prepayment using PayPal or a credit card. If you do not receive this prepayment email, please contact us straight away to our email (you could find on your booking confirmation letter.) Also please have a look in your spam folder, it might automatically get sent there due to your email settings. The three person bungalow in the middle of the beach is amazing! We came here during quiet times so there wasn't much partying in the hostel. 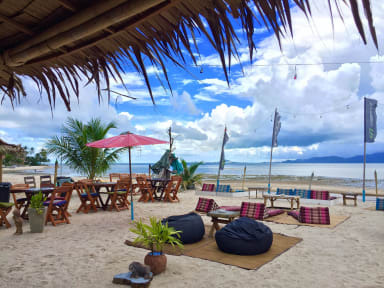 Nevertheless, it's a great place to chill out in the hammocks or lay on the beach which is about 1 meter away from the bar. Great people here and a very enthusiastic owner. Really enjoyed my stay at this hostel. The most friendly staff i’ve met so far. Met new fellow backpackers within minutes at the beachbar. Looking for a cool place to stay? This hostel has it all. One of the coolest hostels I've ever stayed at. Located right on the beach, this place is all about party all night and chill all day. The big dorms are amazing, try to book your stay in there. It doesn't have a lock (no risk of losing keys! ), but there are lockers for your valuables. Staff is friendly and know how to get the party started. In the morning (or afternoon), you drag yourself to the beach, plop in a hammock and enjoy the sun with a coconut from the bar. Rent a scooter to get around. Zeker een super goed hostel om te verblijven als je alleen bent. Iedereen is heel sociaal en je ontmoet dus snel nieuwe mensen. Buiten de fullmoon periode is get wel erg rustig. Bedden zijn wel oke alleen voel je de harde veren. Ook heb je geen nachtlampje of een oplaatpunt bij me bed. Pizza’s zijn hier echt heerlijk en personeel is super vriendeijk! Zo organiseren vaak leuke dingen om de sfeer erin te houden! Zeker een aanrader voor als je naar fullmoon party gaat! Leuke locatie aan het strand. Hostel was zeer sociaal en had prima plekken om chill te zitten. Redelijk schone dorms. Enige minpuntje was dat de bedden nogal kraakten. Niet te veel draaien dus.